Viva Las Vegas! Head to Las Vegas right here at WizSlts, the entertainment capital of the world with Vegas Diamonds, a 3 reel, 5 payline slot from ELK Studios. if you hadn't already guessed, Vegas Diamonds has a Las Vegas theme. Las Vegas is known for its entertainment, gambling, fine dining and nightlife. Can't afford to go to Vegas? No problem, you can get the full Vegas treatment in the click of a spin. Viva Las Vegas has a gorgeous dazzling design with lots of fun colours and bright lights. This slot comes with some entertaining features including a nudge feature, a Vegas Diamonds fortune wheel feature and free spins feature. Why not play these slot games? It's time to pack your bags and head to Las Vegas and head out for a night on the town filled with money and top class entertainment. 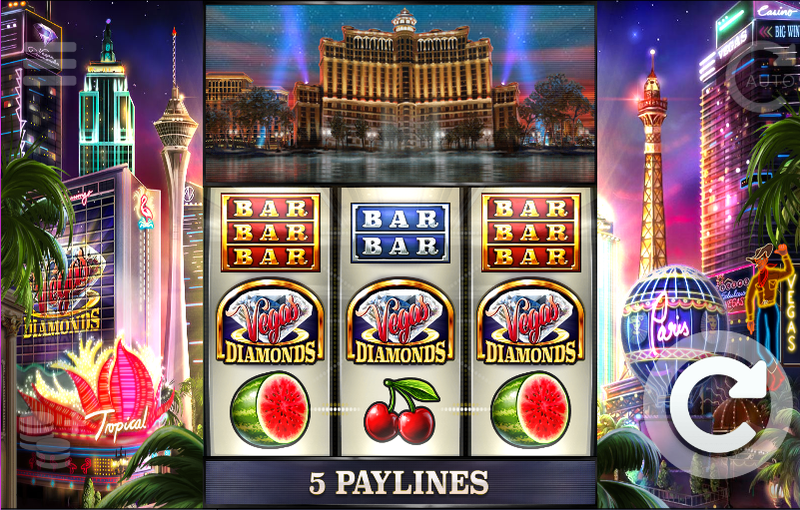 Vegas Diamonds is a Las Vegas themed slot with 3 reels and 5 paylines. It's the third slot in the ELK studio trilogy (with the other two being Ivanhoe and Route 777) and it's just as thrilling. Behind the reels, you'll see the lively strip filled with big bright lights, iconic buildings and infamous wedding chapel. The design is simply beautiful and a true replica of Vegas at nighttime. The symbols all fit the Las Vegas theme and include cherries, watermelons, lemons, bars, double bars and treble bars. Get to experience first-hand why this is one of the best online video slots for new players. Perfect Match Respin Feature - Landing two identical symbols on the first two reels will activate the perfect match respin feature. The first 2 reels will lock into place and you will be given 3 respins. 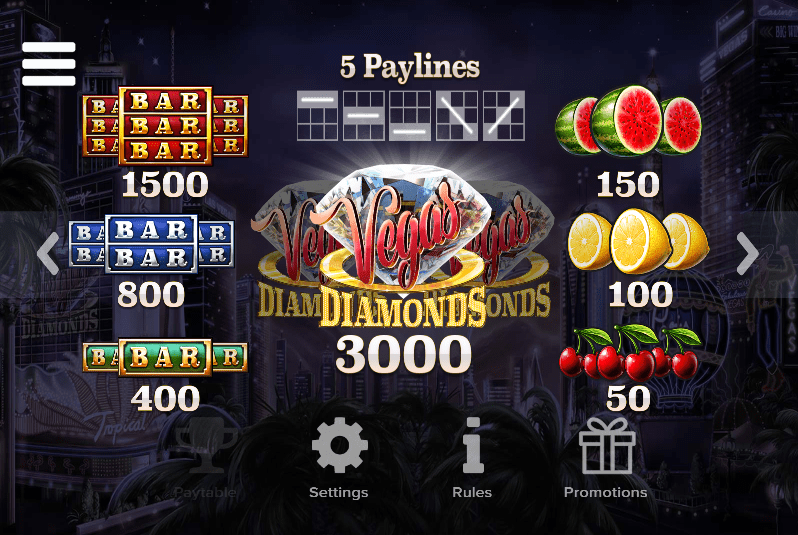 Vegas Diamond Nudge Feature - The Vegas Diamonds are the highest paying symbols in this slot. Landing 3 Vegas Diamonds anywhere on the reel will nudge in place to align the symbol on the middle reel. Vegas Diamonds Fortune Wheel - Land 3 or more bonus symbols to unlock the Vegas Diamonds Fortune Wheel. You'll be awarded 3 winning spins on the fortune wheel here. The wheel has bronze, silver and gold levels which all offer different prizes. The bronze wheel awards the lowest amount of up to 100x your total stake, whereas, the golden wheel offers the highest rewards of up to 1, 000x your total stake. Free Spins Feature - If you land on the free spins section, then you will receive 5 free spins and a 5x multiplier. Bonus symbols landing during the free spins feature will award you an extra spin on the fortune wheel. Ever wanted to go to Vegas? Well now is your chance! Experience the beautiful entertainment capital of the world with Vegas Diamonds. The visuals are stunning and really depict the liveliness of the city. The features are fun and thrilling, especially the golden wheel where you can win up to 1, 000x your total stake. Or why not play Double Da Vinci Diamonds?